Silvio Berlusconi is an Italian businessperson, media proprietor and politician. “Forbes” places Berlusconi at 118th place on the list of richest people of the world. He served about 19 years as a member of the Chamber of Deputies in Italy, and in 2013 he became a member of the Senate. Silvio Berlusconi is the third longest-serving Prime Minister of Italy after Giovanni Giolotti and Benito Mussolini. He is also known as the owner of the Italian football club A. C. Milan since 1986. The former Prime Minister of Italy, Berlusconi has an estimated net worth of $8.3 billion. With such a huge net worth Berlusconi is one of the richest persons in his home country. Silvio Berlusconi was born on September 29, 1936, in Milan. He attended Salesian college and after graduation studied law at the University of Milan. Despite being born into a middle class family, Berlusconi was able to enter the political arena and form a political party, Forza Italy (Go Italy). Since then he has served as the Prime Minister of Italy several times (1994 to 1995, 2001 to 2006, 2008 to 2011). 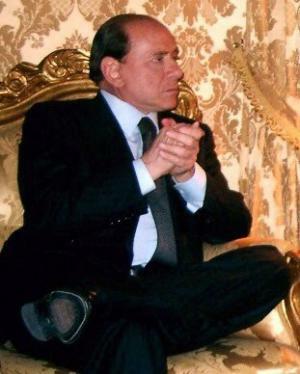 Silvio Berlusconi is an owner of six estates and homes in Italy. Berlusconi’s net worth allowed him to purchase Villa San Martino – this is his prime residence near Milano. This amazing building has a massive 10,000 volume library. In 2008 Berlusconi also purchased the mansion Vila Correnti in Lesa. This mansion even has a special place for a helicopter. The former Italian Prime Minister also owns “Blue Horizon” house in Tuckers Town, Bermuda, which has an estimated value of $7 million. His Villa Certosa in Sardinia is well known as his private villa for entertaining prostitutes. In 1988 Villa Certosa was estimated to be worth of 450 million Euros. Berlusconi also owns a 19th century estate which is worth 86 million Euros. During his amazing politician career, Berlusconi not only built his net worth, but was also labelled with a wide variety of nicknames – he has been called Berlusca, Papi, Psiconano, Unto dal Signore, Nano and even The Knight. Being popular as a politician, Silvio Berlusconi’s net worth was raised even more because of his criminal allegations and scandals including child sexual abuse, false accounting, defamation and even mafia collusion. In October 2013 Berlusconi was involved in four ongoing court trials. The best known of them was defamation against Antonio Di Pietro. There have been many documentaries created about Berlusconi. For example, in 2005 the documentary film “When was Silvio – History of the period Berlusconi” directed by Beppe Cremagnani Enrico Deaglio was released. Today Silvio Berlusconi’s net worth is well known to everyone thanks to Forbes magazine which reported him as sixth richest man in Italy, but he is still behind such people as Giorgio Armani and Michele Ferrero. Nowadays Silvio Berlusconi lives in Milan with his wife. The famous politician has five children from two marriages. Three of them nowadays occupy important posts in Fininvest.